The Colorado Department of Transportation is doing everything it can to ensure folks who are driving to Wyoming or Nebraska to view the totality of the solar eclipse on Monday are safe and will all be able to get where they are going. Throughout the country, preparations have been underway for months for people to flock to areas in the path of "totality" for the eclipse. And Colorado is no different. CDOT has been working with Colorado State Patrol, Wyoming Department of Transportation as well as local, city and state first responders and emergency management officials to develop a plan to try to make Monday as smooth as possible. Strategically staging with State Patrol and local emergency responders along the major corridors to respond to incidents on the roadways. Closely monitoring traffic and incidents from CDOT Traffic Management Centers using traffic cameras and other Intelligent Transportation System devices. "This has the potential to be a major traffic event. Both given the heavy traffic volume as well as disruptions due to the eclipse," said CDOT Executive Director Shailen Bhatt. "We are asking the driving public to plan ahead, be safe, and be patient." Currently, predictions for attendance in Wyoming and Nebraska are very high. Some experts are predicting up to 600,000 more people cramming into Wyoming to witness this. That's basically doubling the population of the state. And we know a lot of those folks are going to be coming from the south so all Colorado highways heading there (I-25, US 287, US 85, CO 52, etc.) are expected to be busy. Since the eclipse is on a Monday, traffic is expected to be heavy through the whole weekend before but will probably be even worse coming back after the sun shines again. Depending on exactly how many people travel and when they travel, this could be the most significant traffic event of the entire year in Colorado. Imagine 6 Denver Broncos games all getting out at the same time on the same highway to go home. Extremely high traffic volume is expected Friday through Tuesday, with exceptionally high traffic on Monday after the eclipse, returning from Wyoming and Nebraska. Travel delays could exceed several hours, between Wyoming and Denver, especially for return traffic on Monday. CDOT expects the highest delays to be on Monday between noon and midnight, southbound from Wyoming to Colorado Springs. Delays could last through Tuesday. CDOT strongly urges travelers to avoid travel during that time. * Pay attention, and don't drive distracted. Drive defensively because there will be more motorists on the road, and some of them may be slowing down or may not be paying attention when the eclipse is occurring. * Ensure vehicles have plenty of fuel. * Don't stop and pull off onto the side of the roads. * Don't use the center median crossings on the interstates for turning around or parking. Those crossings are for authorized vehicles. Emergency vehicles need to keep these areas clear for response to emergency situations. * Don't park on any highway shoulder or in any ditch area. That can not only be dangerous for you and other drivers, but a person's car exhaust could start a grass fire. 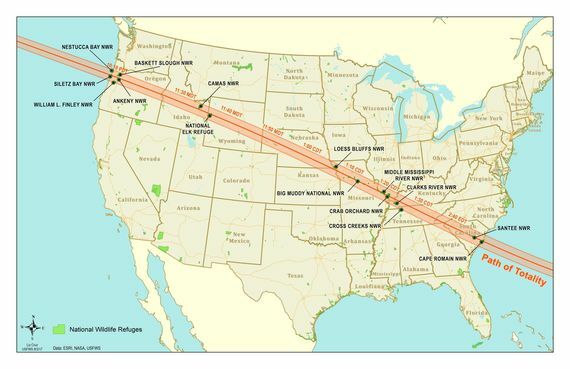 * Plan ahead and move to a safe and legal area prior to the eclipse so you can enjoy the experience. * Use eclipse glasses to safely view the eclipse. These glasses provide eye protection from the eclipse. * Bring plenty of water, sunscreen and snacks. It is unknown how busy traffic will be, but with hotels and campsites sold out, we are expecting large amounts of traffic surrounding this momentous event. This is also the first day for Colorado State University students and freshman orientation for Colorado University. * Travelers should check applicable traveler information for Wyoming and Colorado (COTrip, 511, GovDelivery alerts, mobile navigation apps) before departing and reference traveler information throughout their trip to avoid significant delays. But realize that, depending on the traffic, cell phone coverage may be overwhelmed.